Proprietary Name: Regular Strength Enteric Coated Aspirin What is the Proprietary Name? 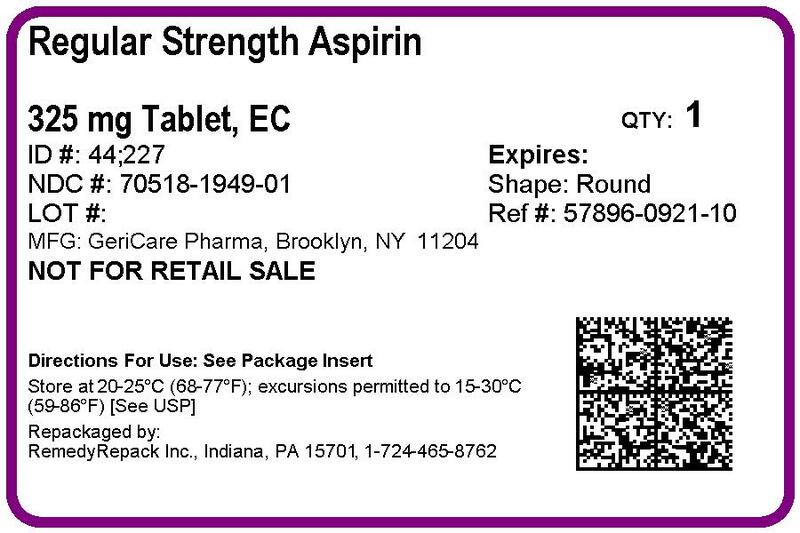 Regular Strength Enteric Coated Aspirin with NDC 70518-1949 is a a human over the counter drug product labeled by Remedyrepack Inc.. The generic name of Regular Strength Enteric Coated Aspirin is aspirin. The product's dosage form is tablet, coated and is administered via oral form. Hivesfacial swellingasthma (wheezing)shockStomach bleeding warning:This product contains an NSAID, which may cause severe stomach bleeding. The chance is higher if you:are age 60 or olderhave had stomach ulcers or bleeding problemstake a blood thinning (anticoagulant) or steroid drugtake other drugs containing prescription or nonprescription NSAIDs (aspirin, ibuprofen, naproxen, or others)have 3 or more alcoholic drinks every day while using this producttake more or for a longer time than directedDo not use if you are allergic to aspirin or any other pain reliever/fever reducer. Ask a doctor before use ifthe stomach bleeding warning applies to youyou are taking a diureticyou have a history of stomach problems, such as heartburnyou have: -high blood pressure -heart disease -liver cirrhosis -kidney disease -asthmaAsk a doctor or pharmacist before use if you aretaking any other drug containing an NSAID (prescription or nonprescription)taking a blood thinning (anticoagulant) or steroid drugtaking a prescription drug for diabetes, gout or arthritisStop use and ask a doctor ifyou experience any of the following signs of stomach bleeding: -feel faint -vomit blood -have bloody or black stools -have stomach pain that does not get betteran allergic reaction occurs. Seek medical help right awaypain gets worse or lasts more than 10 daysredness or swelling is presentfever gets worse or lasts more than 3 daysany new symptoms occurringing in the ears or loss of hearing occursIf pregnant or breast-feeding,ask a health professional before use. It is especially important not to use aspirin during the last 3 months of pregnancy unless definitely directed to do so by a doctor because it may cause problems in the unborn child or complications during delivery. acid, talc, titanium dioxide, triacetin, triethyl citrate.